Friends,Fans and followers . Fear the elder , Respect the elder. Remove Auto-Exchange! Lower HC Price! Remove Diamonds! Can be purchased for 20c. Anyone within in the badge has full access to our HQ and should be treated with respect at all times. Please wear this badge when inside our HQ. This Group Made For Crystals Fans. Invite your friends to join this group. Habbo is simply dead and boring. The Global Imperial Forces (GiF) was established on January 7th, 2009 by adam286. 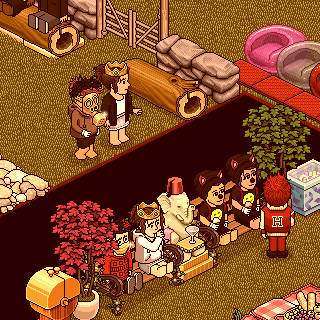 A place to hangout, make friends and earn coins - the greatest Imperial Army on Habbo. The main role of Combatants members are to make sure that Lower ranks are promoted regularly. Also they must submit feedback or recommendations to improve all aspects of MD. Department of Logistics’s main role is to enforce and ensure all members in all divisions are following the code of conduct and procedures at all times. They may also warn and punish rule violators according to the rules and regulations. The main role of Diplomatics are to assist Law Enforcement members with the lawful proceedings of the agency. They may submit useful suggestions and ideas to the forum to help improve the agency and the system for law. Members that have advanced from Diplomats to Forensics Investigations Committee have become skilled members in investigation. The main role of members of F.I.C is to ensure that everyone is logging their promotions, demotions and strikes. A high rank’s main role is to ensure all members under his/her division are following the Code of Conduct and procedures, as well as issuing orders, rewards or punishment to lower ranks according to the rules and guidelines. The main role of bobba are to assist all divisions by answering them their queries of all aspects of MD by filling the help-desk and also to give tips and hints on rookie members on what bobba of them to earn promotions and promotions. The security officer’s main role is to inspect all entries into the [MD] via the security stations with the basic usage of forums and ensuring no foreign breach in MD occurs at any point of time. Members that advance from Top Management to Senior Management are Senior Leaders who have mastered the code of conduct. These members deal with day to day problems within MD. As a member of the Senior Management, you are now allowed to have you own PA. The main role of Top Management is to give suggestions to the MOD of Top Mnagement on ways how the agency could improve. This could be things such as new rules, better pay system etc. Also, they must ensure that everyone has the correct B.U.M in base. A Trainer’s main role is to educate all new recruits the rules and regulations as well as the guidelines and Code of Conduct of [MD]. All Trainers will put on a cream coloured uniform when on duty. bobba change you want to see in the world.. This badge, signifies the personnel who've served under General DanielAbove, in the United States Marine Corps. Thank you. The badge signifies the wearer opposes wiseguy organisations and will do their best to disrupt their buisness. We refuse to pay the pizzo. Pj's only advatised by <LIL-05-WAYNE> Do Not Ask For VIP! !